Safe to say that when the Methodist Church is on your case like this, the garri has been inundated by a surfeit of water. Everyone on social media has a story to tell about someone they know (or perhaps they themselves) being owed their salaries. Crude oil payments generally come in 3 months after the fact which means that in March, Nigeria started to receive the payments for the oil sold in December which is when oil prices really collapsed below $50. Roughly speaking, payments to states have dropped by around 30% from the average. In December it was reported that 22 states were owing salaries (if you type ‘states owing’ into Google, it autocompletes it to ‘States owing salaries in Nigeria’ for you) for any given number of months. Some states have taken the ‘novel’ approach of paying what they can – in Kwara I hear 85% is being paid while in Kogi it was reported that only 6 out of 21 local governments could pay 60% of salaries with the rest paying 30% – 40%. I imagine most people will say 30% bread is better than no bread. This is perhaps what makes Osun the worst offender; it is not paying at all from what I have seen and heard. When the issue of non-payment of salaries comes up, I find it frustrating how the debate (predictably) goes. People tend to take a fundamentalist view of things – if a state is owing people salaries, it must pay. It is against the Bible and Koran to owe civil servants their salaries and so on and so forth. Even people who don’t usually comment on other matters will typically weigh in with how the offending state should pay the salaries it owes with immediate effect. Well, it is indeed unconscionable for a state to employ workers and not pay them. People build their lives around being paid their wages and denying them their salaries can be a massively disruptive event. Further, after the salaries have been paid, it is unlikely that the workers will become productive and happy, compounding the problem. What is annoying, though, is that the debate stops once the salaries have been paid. If oil prices go back up to $80/barrel, the evil day gets postponed till further notice. This raises the status of the act of paying salaries to the level of a glorious achievement while at the same time encouraging Governors to do whatever they can to patch the situation while waiting for the bad wind to blow over. The hard questions as to how states got themselves into this kind of mess in the first place always come second to ‘just pay the salaries’. By what standard of fairness is it ok for a state to spend 80% of its income on less than 5% of the population? I saw someone on twitter say that after Mr Lagbaja got sacked from the civil service some years ago, he had to suffer the ‘indignity’ of going to learn how to ride an Okada as a new source of income. This is fascinating to me because of what it suggests, perhaps unwittingly – that someone good enough to be a civil servant is only good enough to be an Okada rider in the real world? If, as some like to say, there is a ‘hidden benefit’ of paying people to not produce much in the civil service (the money takes care of their dependants), what is the cost? Benefits surely cannot be considered in isolation. It is telling that when the Osun Governor asked labour leaders to come up with ideas to resolve the salary problem, the people who don’t mind eating their seed corn suggested scrapping the free school meals for children. If the Governor ends up scrapping this programme to ensure payment of salaries, do we take this as an acceptable cost? The Federal Government never owes salaries. Whenever there are such stories in the papers and you dig further, you will always find it has to do with a delay or glitch somewhere. But you will never hear the Federal Government is owing workers 3 months salaries or anything of the sort. And there is a good reason for this. 44.-(1) Any Government in the Federation or its agencies and corporations desirous of borrowing shall, specify the purpose for which the borrowing is intended and present a cost-benefit analysis, detailing the economic and social benefits of the purpose to which the intended borrowing is to be applied. (b) the proceeds of such borrowing shall solely be applied towards long-term capital expenditures. We can all agree that the Federal Government breaks the (b) section of that law every 2 or 3 days. Officially the government’s domestic debt is somewhere around the N10trn mark (my usually reliable sauces tell me the real figure is around the N20trn mark). Well, look around you -do you see N10trn worth of infrastructure anywhere? Exactly. Most of the FG’s borrowing, especially recently, has been to fund things like payment of salaries and paying interest on older debt (what Yorubas might call fikan rankan). By next year, the amount spent on servicing the national debt will almost certainly cross the N1trn mark. The Federal Government can defy gravity in this way – if it needs to pay salaries, it can simply print the money to pay (this is the long and short of what happens). It is afterall a sovereign with its own fiat currency. States have no control over the currency so they have to stay within some financial limits. When a state goes to borrow money from the markets for example, most sensible lenders will only lend on the condition of a Sovereign Guarantee. In other words, the repayments are deducted at source before the money gets to the state at all. The pain of such an arrangement becomes really acute when allocations are reduced. So what to do? I am not convinced that the structural problems that cause states to get themselves into a mess like Osun has can be solved by democracy as we know it. Politicians will always have an eye on the next election so taking a knife to a bloated civil service is a mug’s game. Campaigning against a Governor who has sacked workers is the easiest thing in the world. You can pretty much call him the love child of Hitler and Pol Pot and you will find an audience in the electorate – the former Governor of Osun State from 1999 – 2003, Bisi Akande, had the nerve to reduce the state civil service and was promptly defeated at the polls by Olagunsoye Oyinlola who then went on to reinstate most of the sacked workers. Today ‘IGR’ has become like a magic or even fetish word. Everyone believes in it and wants more of it. This in turn means that you hardly ever see any analysis of what exactly it is makes up IGR from any state – everyone just runs with the headline figure and use it to compare how one state is doing against another. The reality is that most states are not actually generating any revenue. What they report as IGR is mostly PAYE that they deduct from workers salaries paid from federal allocations. Remove this PAYE ‘IGR’ and most states are generating absolutely nothing. If this sounds like an accounting ruse….well, me I didn’t go to school. I can think of 3 possible solutions to this problem. 1. At the moment, the FG collects all corporation taxes while the states collect employee taxes (PAYE). What if we were to reverse this? As is painfully clear, states can only really generate revenues from where wealth is being created. This is why you see states behaving like parasites and gangsters shaking down any business for whatever they can extort from them. Last year, it was reported how Osun State (inspired by Lagos State) was threatening to shut down MTN’s operations over non-payment of ‘right of way’ fees. This happens in almost every state where governments do everything they can to frustrate business until they can extract something from them. Under this arrangement, states are not obliged to do much to establish the environment that makes it easier to do business. Indeed, they can be as hostile to business as they want. The job of attracting business to Nigeria mostly belongs to the FG. Meanwhile, the person who gets the blame for lack of jobs is the FG while the states collect the taxes on jobs. Maybe if we let states collect company taxes while the FG collects employment taxes, incentives might be better aligned? It might also force states to think about the things to do to actually attract businesses or maybe even lead to competition on taxes between states. There are problems with this idea of course, but the current situation is hardly working. 2. Since the government is immune to this problem the states face, it might as well help out the states. That’s what friends do. Let’s create a fund and call it the Pretend As You Were On Condition of Fiscal Rectitude Fund (PAYWOCFR). This fund will be like a smoothing fund for the bad days when oil prices drop off a cliff, as they have now. 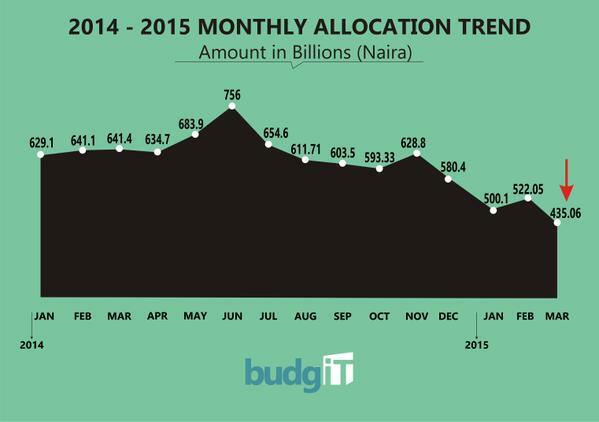 So imagine State A – in a normal month it receives N5bn per month in federal allocations. Oil prices crash and its monthly allocation reduces to N3.5bn. It can then tap into the PAYWOCFOR for an extra N1.5bn to meet the shortfall. There will be a maximum a state can draw down based on say, the average it has received in the last 12 months. If oil prices bounce back up and the state’s allocation goes up to say, N7bn, the extra ontop can be deducted to repay into the fund. The point of this PAYWOCFR is to allow states some stability so they can say with a measure of certainty, how much they will be getting each month, high or low oil prices. The key with this is the pound of flesh that will be extracted from the states in exchange for allowing them tap into the fund. There are a whole bunch of conditions that can be attached to allowing access to the money. Feel free to think of all the things that could go wrong with this e.g when things go back to ‘normal’, will states be obliged to keep whatever commitments they agreed to when they were desperate? 3. You can read about the bankruptcy of the City of Detroit on the Wikipedia page. After years of mismanagement, bad luck and population decline, the city had had enough with debts of up to $20bn. Today, 2 years after, it has started the very long process of healing which includes things like the Blight Removal Task Force kicking down 200 abandoned properties every week. But Detroit is merely the largest city to go bankrupt in America. It is not the first and certainly won’t be the last – about 13 municipalities have filed for bankruptcy since 2008. It’s a complicated process that is usually triggered by states owing salaries, pensions and everything else. Here in the UK, it is very unlikely that councils would go bankrupt but councils that run into trouble (not just financial) can be placed in special measures which allows the central government to take over the running of all or parts of the council’s operations for a period of time. Think of either option as a State of Emergency but triggered by an economic crisis as opposed to a breakdown of law and order as we are used to. And why not? It will be an opportunity to force through strong medicine to get a state back in financial shape. There are no easy answers anywhere as far as I can see. Which means its more likely that things will continue as they are. Great post. Try doing this for Kaduna. States should collect part/all of corporate tax as well as VAT. These are all basic tenets of the ‘True Federalism’ mantra being bandied about (mainly by PDP) recently. I think decentralizing taxes was among the recommendations made by the ConFab report. Option 1 seems necessary whether or not states are made more autonomous, due to the unpredictability of markets, especially raw materials. Aregbesola is in his second term so I don’t see why streamlining the civil service should be hampered by political considerations. In any case, we should begin to demand that economic and considerations supersede political ambition in governance. Decentralising corporate taxes would be very difficult to implement. A company that has branches in all states e.g banks and telecoms file a single corporate tax return and make payment likewise. What you are asking them to do is segregate their operations, account for profits for each state separately, file separate tax returns are pay taxes in this manner. Or will they pay only to the state that their head office is located at? I’d like to hear how that will work. Corporate taxes will be paid based on where a company is registered for official purposes. It’s the system that operates in the EU and even America. To trade in the whole of the European Union, you only need to be registered in one country. That is why a lot of companies choose Luxembourg and Ireland because of their low tax rates (less than 20%). It is also why the UK has been lowering it tax rates for the past 5 years – if not to attract new businesses, to prevent those already there from leaving. To follow up on the comment above about taxes being paid in the one state you’really officially registered, it would incentivize the states to compete for businesses to be registered in their states by lowering taxes, upgrading infrastructure so that businesses will want to register in those states. When Ireland went bust and needed a bailout, it’s interesting that the bigger European countries tried to bully them into raising their taxes as a condition for the bailout. Maybe it’s time to start looking at constitutionally creative options here… State mergers / shared civil services / outsourced civil service (although I must admit that is a VERY risky proposition in Nigeria). A few years ago (under Abacha’s regime I believe), Atedo Peterside suggested that state governments should be the allowed to keep the VAT income collected in their states (currently, this is remitted to the Federal purse). Since this is essentially a sales tax, there is an incentive for state governments to facilitate business growth and consumption in their respective domains. Failing these – let them declare bankruptcy. We have councils here who have been forced to outsource or share services with others. I think the VAT issue is still in court led by Lagos state. But then, what do you think Ebonyi, Kebbi or other small states think about that kind of VAT change? Exactly. 1. How will your solution apply to the Oil and Gas Industry? Did you consider the northern states in all of this? The Oil producing states smile to the bank while the rest do what? Or as Lagos is already a prime location (re your last post), if it decides to be tax friendly and most businesses register there, what happens? As Ireland has attracted many global business HQs in Europe? Why should the Federal Govt regulate, license and provide the necessary infrastructure for businesses to thrive and then get rewarded based on companies recruitment policies? Very unfair. 2. The ECA was aggressively pushed against by the States, what makes you think they will buy into this idea. All it takes is for oil prices to shoot up again before the Fed Govt becomes the enemy again. Many state governors are lazy and can’t seem to think or function beyond the monthly sharing that occurs in Abuja. Kwara state has solid agric plans, Cross River has agric and tourism, Ogun has industries and manufacturing. Some states are generating tangible IGR outside PAYe. Good recommendations but they won’t fly in our part of the world. Meanwhile about 60% of New York state tax collections are PAYE, same for most states in the US; might be interesting to find out if your corporate tax plan has worked anywhere else. 1. You can scrap derivation and let states take corporation tax as normal on oil companies. It’s more money for them anyway. The FG can keep the Petroleum Profits Tax and other special taxes on oil companies. The situation is already what we have now – oil producing states like Akwa Ibom collect up to 7 times what a state like Ekiti collects in some months. There’s no difference now really except that we change the incentives by putting more powers in the hands of the states to chang their own destiny. Yes, Ireland has attracted many more businesses than elsewhere. Apple in Europe is based there for example as well as Google. 2. The PAYWOCFR I propose is different from ECA in one sense. The Governors were able to fight against ECA because they felt it was their money by right given that it was money from the federation account that was supposed to be shared. The PAYWOCFR will be newly created money by the FG so nobody can claim it’s their money. You take it (and accept the conditions attached) or you leave it. It will not be by force at all. The corporate tax plan has worked somewhere – Europe. That is exactly what they currently have. Your man is Osun should downsize and set up an outsourcing company to “recruit” the lost hands. We can agree that only a small portion of the bloated workforce do 80% of the work anyway. The outsourcing company will assign jobs from their roster when need be or rotate staff on various shifts all at reduced renumeration. It will give people the opportunity to hold more than 1 job (which they already do anyway) and some succour that being in the Govt’s Outsourcing database might result in a job. Goodwill will be lost by keeping staff and not paying them, and by also firing them. Change is not always easy. Recall how Generals Saraki and Amaechi led the governors to see to the decimation of the ECA and fought against the SWF? What do you foresee in such regards if a PAYWOCFR is set up? How would the states that feel they do not have to borrow much respond to those that seem to borrowin too much? One other thing – I wonder who withn CIVIL SOCIETY would be bold enough to ask AREGBESOLA “How come he is the only GOV owing this kuch” now that all iur activists have become appendages of the APC? This Favour guy though. Every discussion is viewed from an APC/PDP lens. Very interesting ideas raised here. Detroit is a particularly vivid illustration of how a city can go into decline due to mismanagement. The issue of revenue generation and sharing seriously needs to be addressed in order to ensure a viable and continuous fiscal state of affairs.